Sometimes — feels like most of the time in the Pacific Northwest — the weather forecast is meaningless. You might head out with high hopes of skiing in the sun, above the clouds, but instead get stuck in an endless winter white out. That’s what happened to my girlfriend, Aubrey, and I this past weekend on our overnight adventure to Mt Seymour in British Columbia. When we arrived at the summit we couldn’t see more than 100 feet in front of us (the route to the summit is marked with wands and well travelled, so route finding was no problem). We figured (we hoped) it would clear at some point that afternoon, or maybe overnight. We set up our cozy tent and crawled inside. That afternoon my friend and fellow photographer Adam Gibbs showed up – we had planned to meet here to do some photography. Instead we just chatted for an hour in the mist. The reason we had come to Mt Seymour was that the trees tend to get covered in more frost and snow than other areas I’ve seen. Indeed, there wasn’t a single part of any tree up here that was exposed. That frost is of course all thanks to the combination of the moisture from the mists and the cold temperatures. By morning there were already ice crystals a centimeter long growing off of our tent and skis! It was a surreal experience, to be surrounded by so much whiteness, with eerie ghosts emerging out of the mist wherever you looked. 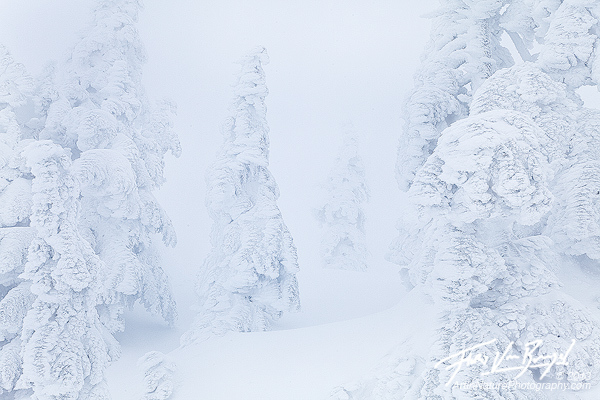 I took this image on our way out, in an attempt to capture the disorienting and spooky feeling of this authentic Pacific Northwest alpine experience. Why is the forecasting so meaningless? Local climate scientist and blogger Cliff Mass has a nice write up explaining the problem: High Pressure Uncertainty. 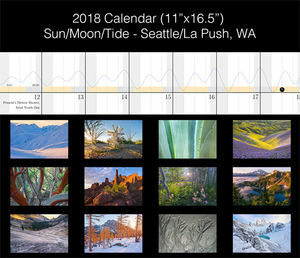 In short, high pressure systems that are usually associated with sunny skies often lead to inversions in the Pacific Northwest, which means temperature increases with altitude, rather than decreasing. This results in low lying clouds and fog, but if you are high enough you can enjoy warm sunny temperatures. Where exactly that layer of clouds is, however, nearly impossible to correctly predict. I’m sure if we had been 2,000 feet higher we would have had spectacular views. To make matters worse, these temperature inversions result in a positive feedback loop, so you can get stuck in these conditions for days on end. 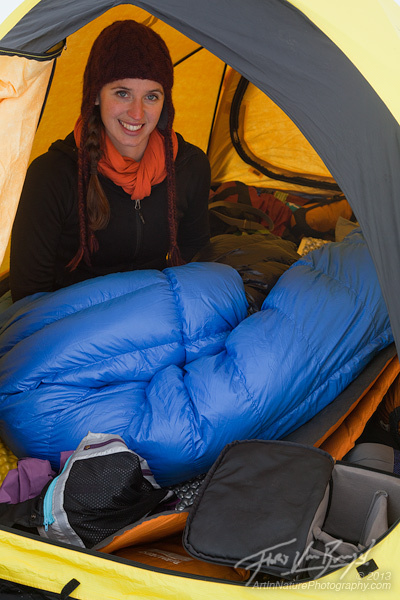 The take home message: bring a nice tent, plenty of warm layers, and some games to pass the time in case you get stuck in a cloud. It really wasn’t so bad, it’s just a shame we never actually got to see anything aside from the mountain ghosts. Aubrey, cozy in the tent. 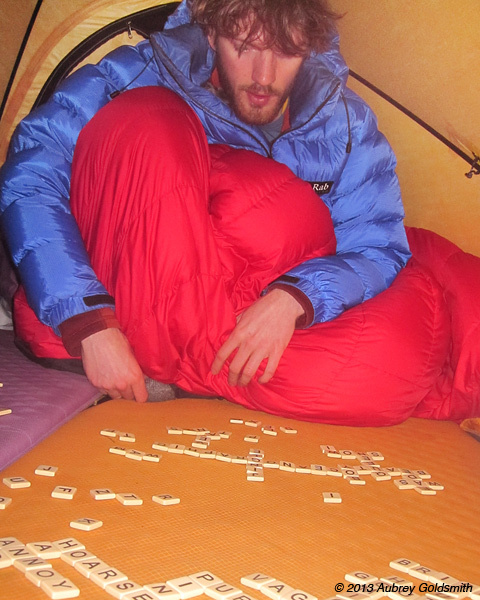 Me, playing bananagrams in the tent with Aubrey, photo by Aubrey. Yes a bag of bananagrams weighs about a pound, but when you're already carrying 50, might as well bring something fun to do!